Can you point to a map of the world and locate Madrid, Toronto and New York? How about Rabat, Bangkok or Caracas? 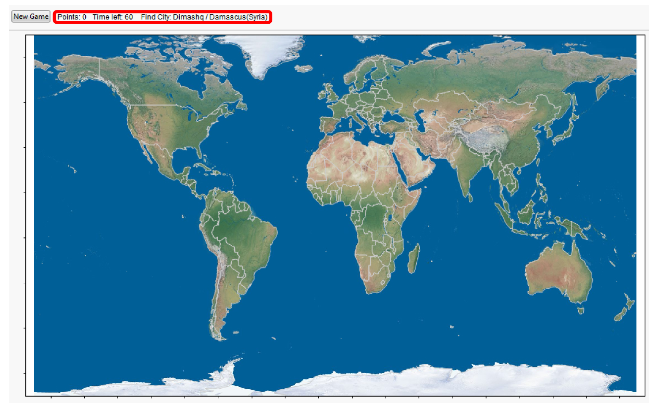 Test your geographical knowledge with this fun JMP game that Sebastian Hoffmeister from our German Training Partner Statcon developed and shared via the German Statcon blog. I played the game and…well, I have to admit that there is a lot of room for improvement! See the city you need to find in the text field on top. Use your mouse to point and click on the location that you think is right. Now JMP shows you the real location and – depending on your vicinity to it, your score. The clock is ticking: You have 60 seconds to guess as many cities as you can. I got 61 points. How many did you get?